What is are Industrial Services ? Looking for an industrial garbage bin? We have just the thing. Our business waste management services are environmentally friendly and ethically sourced disposal facilities. We bring the best garbage bin rentals to your business. Simply give us a call or visit our online quote . Trash King is a waste management company that understands businesses that create waste. We offer reliable garbage bin rental services that can be temporary or long-term and on a fixed schedule or on demand. Simply give us a call today to find out what our bins rentals services can do for your business. That’s right, we offer industrial services like garbage bin rentals, dumpster rentals and other services for industry. Simply give us call and we can help you get rid of your waste. HOW TO RENT AN INDUSTRIAL GARBAGE BIN! Renting a garbage bin for industry is easy! Just give us a call or visit our online quote page. You can describe your project to our industrial disposal team and they will help you choose the size and frequency for delivery. We can adjust the delivery schedule and dumping timing to meet the changing needs of your business. After each service, we will provide documentation and bill accordingly. We dont use contracts and you can cancel anytime. Trash King is an industrial dumpster rental company that delivers on-time dumpsters to homeowners, business and industry. We work with you to choose an industrial garbage removal solution that is efficient, cost effective and meets the environmental standards of your organisation and community. We haul food waste trash, household rubbish, junk from old tenants, materials and off-cuts from a production line, corrugated cardboard and scrap metal as well as general industrial waste created in da...y-to-day operations. 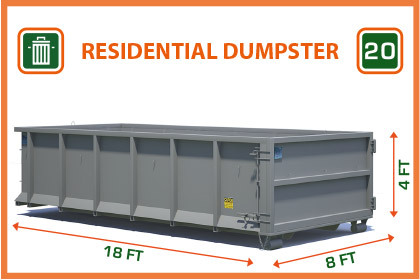 Call (604) 433-5865 and find out about our dumpster rental service today. What Makes A Good Industrial Garbage Bins Company? 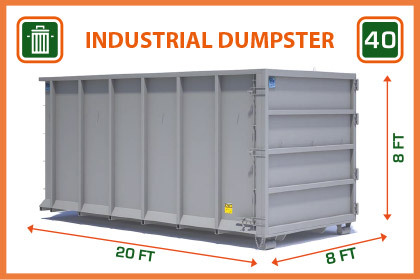 Consider, whether the industrial dumpsters are available for long-term and come with free delivery. Why would you want to pay for dumpster delivery? It’s a foolish way to waste money. Instead, hire a company like Trash King who never charges for their same day dumpster delivery services. If you call before 10am, you can get the bins delivered same day for no extra cost. Moreover, the industrial dumpsters cost needs to be a factor... when choosing a professional rental company. Why pay the exorbitant rates of Super Save Disposal if you don’t have to? Trash King offers industrial waste dumpsters for rent at fractions of the cost of the large industrial dumpster companies. That’s right, when you call Trash King, you get more for less. Our industrial waste clients benefit from on-time delivery. We deliver and pick up our dumpsters exactly as we promise. Sometimes there are factors beyond our control, but we staff extra drivers and trucks to handle surplus demand during peak season like summer and back to school rush. We also have a huge inventory of industrial dumpsters for rent and you can keep them for as long as y...ou want. We work with construction companies and put multiple 40 yard dumpsters on site to accommodate whatever waste and garbage your site produces. If you are looking for the best dumpster rental company for industrial clients, choose Trash King and see what a difference our customer service can do for your company. Why Choose Trash King for Industrial Dumpster Rental? 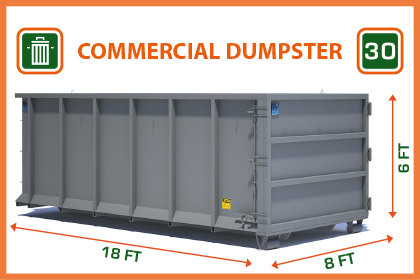 Trash King has several different sizes in their industrial dumpster rental selection, to make it easier for you to find the right size to suit your needs. Trash King’s industrial dumpsters are made with tough, quality materials to ensure maximum durability. At Trash King you can always find the best rental prices as well as the most options to fit your needs. For more information and prices call or ...go online to Trash King.ca. Do Locals Use Your Dumpster Service? Locals call Trash King for the most affordable dumpster rentals, and count on them to deliver when they say they will and pick up in a timely manner. You can trust Trash King with your industrial dumpster rental project too. Visit Trash King.ca to learn more about the dumpster services they provide or call to book a dumpster rentals today. – For hassle-free dumpster rental, locals rely on Trash King time after time. They know when their clients are looking for dumpsters for rent, they want to experience a seamless rental process from start to finish. With Trash King, it starts with a simple phone call to discuss your needs. In the event that you require an emergency rental, Trash King can deliver same day at no extra cost if you call before 10am. Your personal agent will manage all of the det...ails of your rental, including working closely with your crew to determine the perfect placement of the bin for optimal disposal of materials. If you are looking for a waste management solution for your manufacturing business, cannabis business or other industrial application, then Trash King is your perfect solution. We offer flexible rental periods, with guaranteed recycling and reduction of carbon footprint services for every dumpster bin that we rent. We are LEEDS certified and can get you receipts from our recycling partners to ensure that you get your maximum credit for the waste that you have removed.